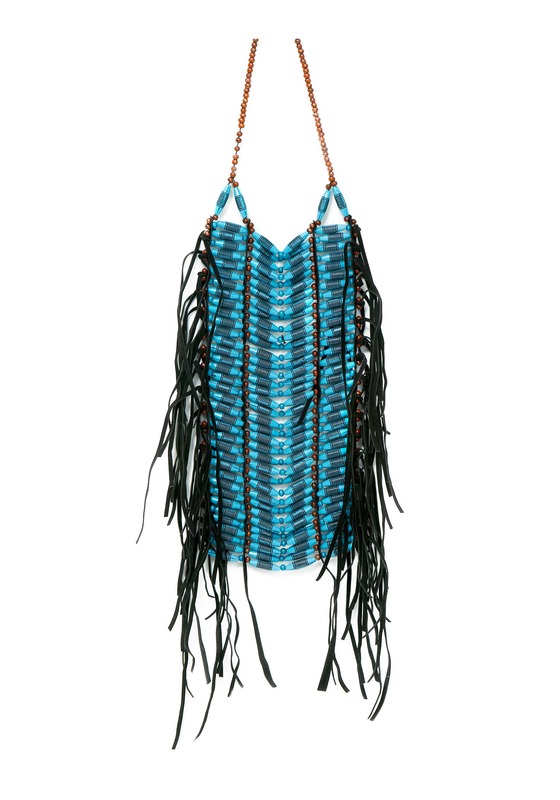 This Native American-inspired breastplate is a fascinating accessory that will pull your look together instantly. Breastplates are usually recognizable, but not everyone knows exactly what they are, or what they’re called. At first, these breastplates were used in battle to protect the wearer from arrows and spears. Eventually, they became used as an ornamental and ceremonial dress—often times they were used to display an individual's wealth or strength. This particular breastplate is inspired by those authentic versions and is rich in color and style. At one time, these tribal breastplates were fashioned with bones, bear claws, feathers, buffalo fur, and buckskin. This one is a similar design that is inspired by these beautiful works that are often found in museums and art galleries today. Featuring vibrant blue beadwork and corded fringe, this accessory is sure to provide a unique element to your style this year.